While after a warm night the atmosphere is gradually warming up, the family are working themselves into a sweat tidying up the house at the Overtoom and filling the car (parked at the Overtoom) with luggage. This year, the animals and plants will be taken care of by neighbour Jasper, about whom the family have learnt that he makes paintings of buildings, which in Lea's view can be labelled Magic realism. The family leave relatively early: at 1.30 pm all the goods packed in some twenty plastic bags have been stowed into the boot of the GRV (Garish Red Volvo). Having arrived at their holiday residence, they find Annelies, the owner of the house, on the refurbished patio ofthe Platluus. She not only sports a shiny red van, but a new pussycat as well � of royal descent, of course. Soon the daughters are spotted in the garden aiming the jet of a supersoaker (a kind of oversized toy water-gun) at a ball they have thrown up. Last night, refreshing showers have fallen on the earth. It's considerably fresher than yesterday. Right after breakfast, the two daughters resume their regular playing routine. This time, Bear and Mouse play prominent r�les. Both the daughters and their toys sway gracefully to the rhythm of the music of a CD that Violet put together yesterday shortly before their departure. It is weekend and the weather is fair. According to the television, a record number of visitors are expexted on the Belgian coast. Lea proposes to park the GRV (Garish Red Volvo) near Knokke's railway station and take the tram from there to Heldenplein at Heist. It soon becomes clear that all the parking places near the station are occupied. Eventually, they find a very tight space for the car close to the tram stop near the water tower. The rest of Lea's plan turns out to be a happy choice: Albertstrand is remarkably quiet -- even on this busy day. After they've had a good time at the beach for an hour or two, the sky gets more and more overcast. So the aforementioned journey is made again, but now in reverse direction. During the night, Violet is kept awake by a number of buzzing insects. After Tom has undertaken some action, in which a swatter plays an important part and the bloody details of which will not be revealed here, everybody can go to sleep again. The sky is cloudy and the family get up rather late. They decide not to go to the beach. But a visit to Oostburg won't be a problem, will it? After their arrival in the town, they agree to split up into two groups for an hour. The parents purchase two extremely low priced folding-beach-chairs (with the reasoning: it will have paid for itself after two visits to the beach) and a reduced, but very pretty book about railway stations for neighbour Jasper who takes care of the pets in their home back in Amsterdam. The daughters come back with a headscarf decorated with a skull. 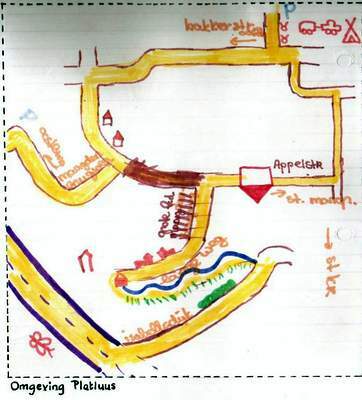 Until dinner-time, the daughters undertake a cycling trip (both of them on the same bike) and make a map of the area. They bring a half-dead butterfly which they have put in a Pringles box. Needless to say for that end all the Pringles crisps had to be eaten first. Early that evening, the daughters use their pirates' headscarf as principal attribute in blind man's buff and similar games. Before the daughters go upstairs, they watch a tv programme with a clearly scatological character. Sorry sir, you don't know what scatological means? That's a pity: after all, these are decent pages, and we prefer to keep them that way. Last night's tv programme seems to have some impact on the conversation during breakfast. Scatological subjects prevail. The occasion may have been a discussion about the small thickness of the toilet paper atthe Platluus and speculations about the influence this may have on the hands of the visitors to the sanitation room. The sky is cloudy today, and it's rather fresh. This will, however, not prevent a visit to Knokke. Having arrived at Knokke, the family agree to split up into two groups of two. They will meet again in an hour at the children's house. But before actually getting there, a few hundred tempting shops have to be passed, real consumers' traps, which - unlike a regular mousetrap -- don't use a piece of cheese to attract their victims , but a choice of ingeniously designed shop windows. And after the obligatory annual snapshots have been taken at the children's house, the journey back is undertaken and all the temptations of the Lippenslaan have to be resisted again. Eventually, they succumb no more than five times: a bracelet, candy, a T-shirt, a small tripod and a pair of sandals are purchased. The daughters have taken to cycling so much that they put to their mother a proposal to do some shopping at Oostburg. In the process, another consumer trap which is called "two at the price of one" takes its toll. Violet buys gym shoes for herself and her mom (for the price of one pair). After their return, sher decorates hers with checkers. When Violet goes to bed at night, she alerts her dad because once again there is a mosquito in her bedroom. A swatter is used to make the monster meet its maker. At the moment when the insect is squashed Violet's recently sucked up blood spreads out over the wall. That television has a less favourable influence on social life becomes clear once again when the idiot box -- as a tv set is sometimes referred to -- is left on during breakfast. The otherwise vivid conversation is almost completely absent. By the way, the box has again promised fair weather. So it might not be a bad idea to pay another visit to Heist. At about a quarter to one, the party leaves and is later found at the terminal of the coast tram at Knokke. They still have to take photos of the family, which are to be sent as postcards. Near the tram stop, Tom attempts to get the family (himself included) photographed. But the only place where he can put the table tripod is the saddle of a bike that is resting against a tree. When the tripod slides away repeatedly, Tom finally abandons his attempts. Having descended from the tram at Heldenplein, they again try to photograph themselves as a group. The tripod is put on an electricity box and Tom crosses the rails a few times in order to be photographed along with the rest of the family. The camera is not a digital one, so it will not be known until later whether the photos have come out well. 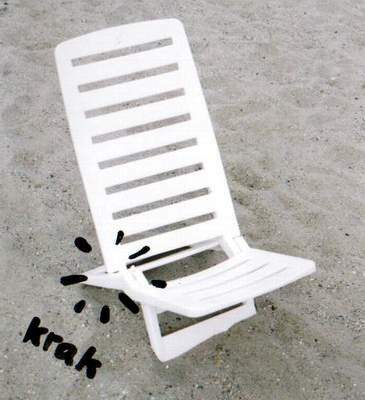 On the beach, the transient nature of worldly goods becomes clear once again: when Tom leans back on one of the chairs purchased yesterday, a crack is heard -- after which no more than one chair is left to be sat on. In the afternoon, the daughters explore the shopping area of Heist. Later , they return fifty euros poorer, but this time supplied with a T-shirt (with apple picture) and a blue-and-grey cardigan. The television weather forecast turns out to have been somewhat inaccurate: as the afternoon progresses, more and more clouds gather in the sky and when the company returns and reaches Langeweg (between Draaibrug and Sint Kruis), it even starts raining. For today, unsettled weather has been forecast, with scattered showers -- as weather forecasters seem to call it. Under such circumstances, Ghent is usually a favorite spot for the family to go to, the more so since the "Gentse Feesten" (Ghent Festivities) are on. While the GRV (Garish Red Volvo) is chugging towards the Belgian city mentioned above, the weather forecast seems to be reasonably correct: Lea regularly has to turn on the windscreen wipers. But once the GRV has been parked, the weather soon improves. They will soon find out that the 'Gentse Feesten' are just like 'Koninginnedag' in the Netherlands, but not just one day, but ten days in a row. Once again, the family split up in age groups: the daughters purchase clothes and trinkets and dine at McDonald's, while the parents only buy books and take half a dinner at Bloch's. During the walk, Lea undertakes a short-lived affair with a new boyfriend, a rather quiet type. As agreeed, they meet at McDonald's at six o'clock. And after fighting their way to the thronging crowds, they drive via Delhaize (a Belgian - rather upmarket - kind of supermarket) back to the Platluus . After breakfast, the daughters play something they call zigzag and which seems to originate from the television. The first part consists in getting dressed using only one hand, an activity which is not an easy task, in particular with zippers and laces. But the keyword turns out to be co-operation. The second assignment involves baking pancakes, for which they first need to go to Oostburg (by bike) - from which they are seen to return one and a half hours later. In the afternoon, their parents also leave for Oostburg, where they purchase the most inexpensive beach furniture that has probably ever been sold in Zeeland: two folding chairs for 3 euro each (let's hope it won't undergo the same fate as its predecessor). When they return, the reap the fruits of the zigzag game: the daughters have baked delicious pancakes. It must be said that it's not easy to establisblish what belongs to the zigzag game and what doesn't. For instance, would their efforts to make their room look as chaotic as their quarters at the Overtoom also be part of the game? The weather is so fresh and cloudy that the family opt for a day at Oostende. They prefer to make the trip by tram -- a decison they will deplore in hindsight: for over an hour they will 'enjoy' an overcrowded tram, where the air can best be described with the adjectives clammy, stuffy and humid. But in Oostende the air is fresh again and their suffering is soon forgotten. The family will split up no fewer than three times, every time agreeing to meet again at the band stand in the Wapenplein . There is a kind of fair going on, at which the daughters are given green paper bracelets which give access to disco Boccaccio Beach , but for obvious reasons they can't make use of them. As usual, the daughters eat at McDonald's and their parents have dinner at a more conventional joint. You wished to know the name, madam? What about Het IJsboerken ? Would that please you? At approximately six they leave for Knokke in a somewhat less crowded tram. Some quick foraging is done at GB, where the daughters sneakily add large quantities of sweets and potato crisps to the shopping-cart. They come back soon enough to see a larger part of the eight o' clock news. But evidently, the most importnat part of the news is the weather forecast which forecasts rain in the night and an overcast sky for tomorrow. 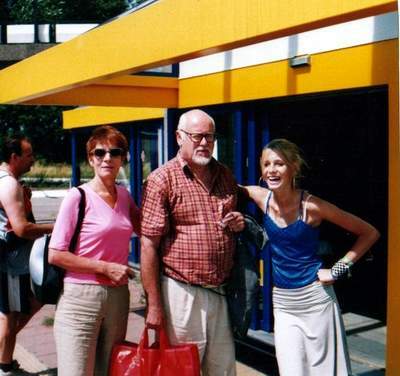 The parents decide to subsidize a visit by their daughters to Toversluis. This is a large hall (in the municipal region of Sluis) where all kinds of entertainment are provided, especially for youngsters, attractions such as arcade games, bowling, darts and a so-called laser arena. The Overtoom parents drop their offspring at the aforementioned attraction at about half past two and set out to do the shopping at supermarket Albert Heyn in Oostburg. By four they receive a call from their children, who wish to be picked up again. After coming home, they use bricks to build a very professional barbecue. As soon as the charcoal is glowing, marinated tandoori-chicken is laid on, which will be accompanied by vegetable curry, cucumber-raita and rice. Later, the daughters will set up a tent, which unfortunately blocks the access to their parents' bedroom. Otherwise some discussion might have been possible about sleeping in it (by the daughters, of course). When Tom wakes up at 7 am, he sees that there is no electricity. Visions of possible consequences, such as a fridge full of rotting food, haunt his early-morning thoughts. But after half an hour of fretting, the lights switch on again and some careless sleep can be enjoyed. An overcast, but mainly dry day has been predicted. So the company from Amsterdam opt for a visit to the beach. The children prefer to go to sandy beach at the end of the Lippenslaan. The parents don't see any reason why they should obstruct this plan. So by half past two they company is seen to enter the "zone payante" of Indi Beach. For those who wish to utilize their knowledge of the French language for the interpretation of zone payante, I have disappointing news: all afternoon the family doesn't pay one cent: nobody from Indi Beach comes to collect any fees. The daughters return from their first excursion to the sea with the information that jellyfish have been spotted. For the time being, no member of the family ventures out into the sea. The daughters may buy a beach-tennis-set. When Violet lies down on the sand after a game, she is accompanied by a group of Belgian children, with whom she spends the rest of the afternoon. Late in the afternoon, Lea is accosted by a group of Dutchmen who are eager to learn where she bought that really unique bathing suit. Well, the Dutchmen seem to forget what unique really means. Yesterday, we received a telephone call from Jasper. You don't know, who Jasper is, sir? Are you sure you read 19 July? But alright, Jasper called to inform the family of the sad news that rat Punky had gone to meet its maker. Shortly before the holiday, the poor creature had made quite a fall, which had caused an extravasation of the size of a large walnut. The vet had judged that this would not be much of a problem. But vets are not omniscient either -- as has become painfully clear now. As is his yearly habit, Tom goes to Amsterdam to clean out the turtle aquarium. While he is there anyway, he will also be able to bury the rat, which was put in the freezer by neighbour Jasper. In Amsterdam, Tom gets up early and takes the train to Vlissingen (aka Flushing). On the train he is surprised by some fellow passsengers, whom it doesn't seem to embarrass to bellow details of their operation or divorce into a mobile phone. The question may rise why we need such strict privacy laws, if for many people it would obviously be no problem to have their most intimate details chalked on posters on the outer walls of their house. After Tom's arrival at around 1 o'clock, the family spend the rest of the afternoon at the beach of Knokke. When the parents perceive a jellyfish in the sea, they give up their plans to enter the water. On the way back to the car, Violet plays a game in which she starts walking next to another pedestrian and Tom has to estimate if his daughter is taller, shorter or the same size as the unsuspecting fellow-walker. Most ladies appear to be shorter. Today the daughters will be taken to Antwerp. As usual, the family is not very early to have breakfast. When Violet picks exactly that moment to take a bath, her mother is not exactly overenthusiastic, but eventually Lea can start the car and at approximately two o'clock the GVR sets off for Antwerp. In the aforementioned city they are warmly welcomed with coffee and cookies. And by four, the Amsterdam family - in two groups of two - ventures into the city of Antwerp. The daughters will later appear to have spent much of their time at H&M, while their parents do a bit of walking in the old working-class district behind the Carnotstraat. At one moment they find themselves in the Kleine Zavelstraat, a street which appears to have become a hundred percent Arab. After dinner, the company spends a short time at the Grote Markt, where music is supposed to be performed. But they arrive during the interval. The daughters devise all kinds of games to keep bordedom at bay, and the parents soon leave for De Platluus. Today the daughters are to return. The car of the Antwerp family is a Citroen Berlingo -- a company vehicle with only two seats. The daughters will be accompanied by their aunt while their uncle (or nonkel -- as the belgians say) will take the car. Besides the two daughters, the Antwerp family brings the same number of costly wine, and also a book into which this story will find its way. After a pleasant get-together, the Berlingo containing the Belgian family is seen rolling its way towards Antwerp. Although during and after yesterday's barbecue at least fifty flies have been killed, the house is swarming again with the annoying insects. Again, Tom sends two or three dozen to kingdom come, but occasional buzzing is still heard. There are also mosquitoes, but their number is smaller than the flies. But the ladies in particular complain about bites (no madam, not bytes ). In the afternoon, Lea drives the family to Knokke. where the daughters don't mind walking the entire length of the Lippenslaan (about a mile) neither do they object to an overcrowded beach. Their parents, however, opt for a quieter beach which takes less walking and take the tram to Heist. Because of the moquitoes, Violet has spent the last nights in the box bed downstairs. From there it is only one step to her television chair, where she is seen watching very early in the morning. This time, both the parents as their children go to the beach at the end of theLippenslaan. Over the full length of the Lippenslaan, the parents haul the weight of their own folding chair. Lea remarks that after today the chairs will have paid themselves back, not taking into account whether they would have managed to hire a seat at all. The sea is wonderful: the briny waters are visited several times. The daughters do some research into Knokke's discos. At the tourist office they receive a map which shows a number of these dance establishents. They seem determined to go on with with their plan to visit the disco tomorrow. The daughters have made a very professional quiz for their parents like twee-voor-twaalf (if that name of a Dutch tv quiz rings any bells to you). For reference they use a tv guide, a Harry Potter book, an issue of Allerhande (the magazine of supermarket Albert Heyn) and some other printed matter available at De Platluus. The Luif-Pijnappel team finds the word (muurbloempje -- wallflower) in a very good time. After the quiz, a postcard industry is started. Both parents and daughters send dozens of cards, which are posted on their way to Knokke. At Knokke, the company board on the tram to Heist. On the beach, the fact that they will go the disco clearly occupies the daughters' minds. By eight, parents and daughters say goodbye and the latter ones are seen walking towards the bustling nightlife of Knokke. De afspraak is datthe ouders hun kinderen om halfeen aan het eind vanthe Lippenslaan zullen ophalen. Hiertoe vertrekkenthe ouders om 12 uur van huis. Als ze een minuut of zeven onderweg zijn, gaatthe mobiele telefoon af: Liset meldt datthe eerste bezoekers pas tegen twaalventhe disco binnenkwamen -- of hun ouders alsjeblieft wat later kunnen komen. Uiteindelijk halenthe ouders hun daughters om 1 uur op. En aangekomen inthe Platluus, gaan beide daughters na een frisse dronk naar bed. Bij het ontbijt wordt besproken welke vreselijke dingen men zoal heeft ondergaan. Bijthe daughters zijn naalden en roestige spijkers in handen en voetenthe meest extreme ervaringen. Violet beklaagt zich dat ze nooit iets ergers heeft meegemaakt dan deze relative futiliteiten. Men heeft mooie bramen gezien in een paar greppels langsthe weg naar Draaibrug. Na het ontbijt gaan ze met z'n vieren plukken. Ofthe hete zomerthe vruchtjes extra vroeg rijp heeft gemaakt, of dat concurrerende plukkers doorthe hitte zijn afgehouden om te plukken --the oogst is in ieder geval overvloedig genoeg voor zes potten bramensaus. Na het onbijt speeltthe familie enige malen het televisie-spelletje Hints. Liset blijkt goed te zijn in het interpreteren van wat haar zus precies bedoelt, terwijl Lea erin slaagtthe lachers op haar hand te krijgen. In vergelijking metthe afgelopen dagen is het tamelijk fris.the hemel is betrokken. Men besluit Blankenberge op te zoeken. Lea rijdt het gezin naar Knokke, vanwaar men metthe tram verder reist naarthe bekende volkse badplaats. Blankenberge blijkt er een geheel nieuwe attractie bij te hebben: een combinatie van een trampoline en bungee-jumping.the kinderen geven zich er allebei eenmaal aan over. Opthe zeedijk is een korfbal-manifestatie en krijgenthe kinderenthe gelegenheid te laten zien dat ze geen beginners zijn. Na een wat aarzelende start gooien (of zoals dat in korfbaltermen heet "schieten") zethe ene bal nathe andere doorthe bodemloze mand. Ook het Velodroom wordt niet overgeslagen. Violet kiest een fiets waar ze niet of nauwelijks mee uitthe voeten kan. Al spoedig ziet men haar met het tweewielige onding dwars opthe baan staan. Gelukkig is haar zus bereid het rijwiel van haar over te nemen. Maar hierna is het Velodroom een al pret voorthe Nederlandse jongedames, die doorthe baas vanthe fietsbaan met grote egards behandeld worden. De familie wandelt nog enige tijd met z'n vieren rond. Tegen half vijf besluit men tot kwart over zes uiteen te gaan.the kinderen betrekken hun maaltijd bij een afhaalrestaurant en verorberen e.e.a. opthe zeedijk. Hun ouders dineren bij een restaurant dat Hippocampe heet. Tegen half acht komt men terug inthe Platluus. Metthe daughters is afgesproken dat ze half twaalf naar Knokke gebracht zullen worden voor een tweede bezoek aanthe disco. Maar zo laat is het nog lang niet. Dus eerst geeft men zich over aanthe nodige verstrooi�ng opthe televisie. Omstreeks 11 uur wil Lea richting Knokke rijden. Ze komen echter terecht in een mist waar Jack The Ripper zich uitstekend in zou hebben thuisgevoeld. Nadat Lea enige tijd haar goede wil heeft getoond door een kilometer stapvoets te rijden, is iedereen het erover eens dat dit gekkenwerk is en keert men terug naarthe Platluus. Eigenlijk zouthe familie vandaag vertrekken, maar omdat het weer zo goed is enthe volgende tijdelijke bewoners pas morgen komen, overlegt men telefonisch metthe eigenares om een dag later naar Amsterdam terug te keren. Omstreeks 1 uur ziet menthe daughters een hybride spelen van beachball en squash. Regelmatig dreigt het balletje verloren te gaan inthe begroeiing of inthe dakgoot. Tegen half twee vertrektthe familie inthe richting vanthe Knokse Meerlaan. In tegenstelling tot op weekdagen, is er vandaag geen parkeerplaats te vinden. Lea bedenkt een slim plan: ze rijdt naar Zeebrugge, waar genoeg plaats is om te parkeren. Vandaar reist men metthe tram naar Blankenberge. De rest vanthe middag brengtthe familie door bij het gepachte strand van Corine.the kinderen maken een bouwsel van nat zand, dat volgens hun opgave een bad is. Tegen zessen krijgt men honger en trekt men naar restaurant Corner House , waar men voor niet al te veel geld een goede maaltijd voorgeschoteld krijgt. Hierna begeeft men zich naar het plein dat genoemd is naar Leopold III, waar niet alleenthe tram komt, maar ook een bijzonder mooie draaimolen staat, waarinthe kinderen een rit mogen maken. De tram is vrij druk, maar ��n stel banken is volledig leeg. Als men zich inthe richting daarvan spoedt, blijkt waarom niemand daar heeft plaatsgenomen:the onmiskenbaar zurige lucht enthe papperige plas opthe grond, waarin een waarnemer met een sterke maag nogthe restanten van een maaltijd kan waarnemen, verraden waarom deze zitplaatsen leeg zijn gebleven.the dames ontmoedigen Tom er een foto van te maken. Thuisgekomen, geeft Leathe auto een goede wasbeurt en wordt al het nodige ingepakt, want morgen moet het huisje voor 12 uur leeg zijn. Voor haar doen isthe familie vroeg op: v��r 9 uur ziet men Tom en Lea al druk bezig. Maar om 12 uur is het gelukt alle bagage inthe auto te krijgen en gaat men op weg. De reis verloopt probleemloos. Na thuiskomst eet men bij Fame, dat geen snackbar meer is, maar een echt restaurant. Hoe het ook zij, ��n ding staat vast en dat is dat deze vakantie is be�indigd.